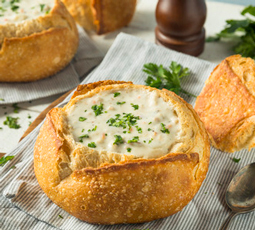 Clam and Oyster Chowder - A recipe from Savor California, the online showcase for extraordinary gourmet foods and beverages from California. Heat in a pan 2 tablespoons butter and oil. Add the scallion, garlic and onion. Cook slowly for two minutes, then add cut-up oysters and clams. Add cubed potatoes, if desired. Pour on the cream and season with the salt, cayenne pepper, and fennel pollen. Bring very lightly to a boil, then add bit by bit the remaining butter and the chopped parsley. Simmer for a few minutes and serve. Serves 4 – 6 as a first course, 2 as a main course. Can be served in a bread bowl.